The Halloween franchise has taken many forms since the first film was released in 1978. In the subsequent years there have been no fewer than seven sequels, two reboots, several novels, and a series of comics. Rather than tangling itself in the franchise’s messy back catalogue, director David Gordon Green pretends that the underwhelming attempts to bring life back into the series never happened. 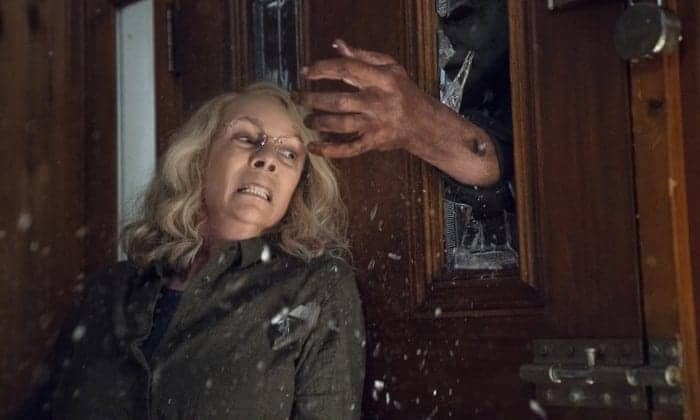 The latest incarnation of Halloween acts as a direct sequel to the original and takes place exactly 40 years after Michael Meyers (Nick Castle) first tried to kill Laurie Strode (Jamie Lee Curtis). In this time Laurie has become reclusive and is still suffering from the trauma caused by Meyers’ attack. She has had two failed marriages and lost custody of her daughter Karen (Judy Geer). She continues to have a troubled relationship with Karen and is not encouraged to see her granddaughter Allyson (Andi Matichak). Laurie’s home is heavily guarded and she spends most of her time waiting for her attacker to reappear. Meanwhile, Meyers has been housed within a high security mental health facility where he is looked after by psychiatrist Dr. Ranbir Sartain (Haluk Bilginer). There are plans to move him to another institute but before the bus transporting the patients arrives at the new facility it crashes and Meyersescapes. He is free and able to hunt Laurie down once more. The Halloween sequels and remakes were plagued by poor writing and lacklustre direction, which failed to recapture the spirit or thrills of John Carpenter’s original. David Gordon Green brings a credibility to the new Halloween and is the most high profile director to be associated to the series since Carpenter. Green has an interesting filmography which shows his tendency to flick between genres. He is most revered for his indie dramas George Washington and Joe, but is equally comfortable directing stoner comedies like Pineapple Express and Your Highness. His transition to horror is pretty seamless and he clearly understands the mechanics of the genre. Meyers has never been scarier and there are more than enough frights to get you jumping in your seat. The film can also be very funny and there is a scene stealing performance from child actor JibrailNantambu who is babysat by one of Allyson’s friends. For the most part Green is able to move smoothly between horror and comedy, even if there are a couple moments when the film’s sense of dread and terror is lost. I am in two minds about the characterisation of Laurie Strode and how she has developed in the 40 years since the original film. Her ready to fight attitude is refreshing and a clear antidote to the abundance of helpless female characters which can be found in 1980s horror films. In the original Halloween Laurie was willing to take on Meyers but did ultimately require the help of Dr.Sam Loomis to fend off her attacker. This time round Laurie is more than capable of looking after herself. At the same time, Laurie has become a slightly unsympathetic figure. Through focusing on her attempts to take on Meyers, the film presents a narrow view of the impacts of trauma and she becomes hard to relate to. All this culminates in an ending seemingly borrowed from Home Alone. It is a bit heavy handed and predictable but allows the tension to be ramped up and the much anticipated face-off between Laurie and Meyers to take place. In the end, Halloween is a fun and effective horror film that manages to tread new ground while remaining respectable of its predecessor. For the first time in almost 40 years the appearance of Laurie Strode and Michael Meyers is not accompanied by disappointment.